Still not sure what you want for Valentine's Day or perhaps an upcoming birthday or anniversary? I have been loving bar necklaces for quite some time now and have been wearing this one that the sweet ladies at Bip & Bop sent me on repeat. The reason these bar necklaces make the perfect gift is because you can customize it to make it even more special to you or whoever you're giving it to. 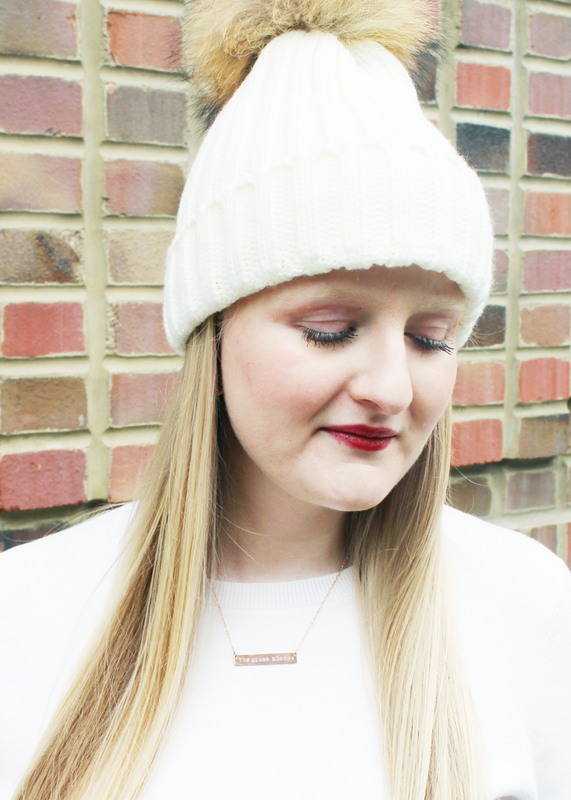 I'm wearing The Jessica which is Bip & Bop's signature bar necklace. I customized mine by choosing rose gold with a sixteen inch chain and having The Blush Blonde engraved on it and there are several ways your can customize yours too. While The Jessica is my favorite bar necklace from Bip & Bop it is far from their only style bar necklace they make. They have double bar necklaces, super skinny bar necklaces, vertical bar necklaces, and more to choose from. The ones I really have my eye on are the coordinates collection, which allows you to engrave the coordinates of a special place onto your necklace or bracelet. I think my favorite part about Bip & Bop, other then their gorgeous jewelry, is that they are a small female owned business. I always love supporting small businesses and amazing fellow girl bosses! Whether you need a gift for Valentine's Day or any other occasion check out Bip & Bop for the perfect present. What would you have engraved on a bar necklace?